Cambodian researchers and their international colleagues have identified a series of mutations which make the malaria parasite resistant to an effective antimalarial drug, artemisinin. The results, published in Nature Genetics on 19 January 2015, could help to improve early detection of emerging artemisinin resistance. France's Guimet Museum has returned the head of a statue of a Hindu god that was stolen from the Phnom Da temple in Cambodia 130 years ago. It was returned at Cambodia's request and reattached to the body on 21 January 2016. Cambodia on 5 February 2014 launched public bus services in the capital Phnom Penh for the first time in over a decade to ease traffic congestion. The last time Phnom Penh had public buses was for a brief period in 2001, but the service was canceled after two months due to lack of interest from the motorbike-riding public. Cambodia and twelve other countries which are home to the world's dwindling population of wild tigers on 6 February 2015 agreed to establish an intelligence-sharing network to fight traffickers. Cambodia hosted the 20th Association of Southeast Asian Nations (ASEAN) Summit, an annual meeting held by the Southeast Asian nations, in Phnom Penh form 3 to 4 April 2012. Leng Ouch of Cambodia won the 2016 Goldman Environmental Prize, considered as the Nobel Prize for grassroots environmentalism, on 17 April 2016. In one of the most dangerous countries in the world for environmental activists, Leng went undercover to document illegal logging in Cambodia and exposed the corruption robbing rural communities of their land, causing the government to cancel large land concessions. Tuy Sereivathana from Cambodia won the 2010 Goldman Environmental Prize, considered as the Nobel Prize for grassroots environmentalism, on 19 April 2010. Tuy was awarded for his work to mitigate human elephant conflict in Cambodia by introducing innovative low-cost solutions, empowering local communities to cooperatively participate in endangered Asian elephant conservation. Cambodia's passenger train services resumed regular operations on one route after 14 years between capital Phnom Penh and southwestern Sihanoukville on 30 April 2016. Three 1,000-year-old statues depicting Hindu mythology are returned home to Cambodia from the USA after being looted from a temple during the country's civil war in 1972. Two 10th Century sculptures, believed to have been looted from a temple in Cambodia decades ago, were returned home on 11 June 2013 from New York's Metropolitan Museum of Art. Cambodia and other thirty-seven countries met internationally-set hunger eradication targets set for 2015 to halve the percentage of hungry people well ahead of time, the United Nations food agency revealed on 12 June 2013. Cambodia banned smoking at the famous Angkor temple archaeological site to prevent fires and aid health of visitors. The initiative started from 13 June 2012. A lost medieval city that thrived on a mist-shrouded Cambodian mountain 1,200 years ago has been discovered by archaeologists using revolutionary airborne laser technology, a report revealed on 15 June 2013. The discovery is set to be published in the Proceedings of the National Academy of Sciences in the United States. A new species of lowland tailorbird with a distinctive orange-red colored tuft of feathers on its head has been found in Cambodia, according to a study published in the journal Forktail on 25 June 2013. Temple of Preah Vihear, a Hindu temple in Cambodia, was listed in the UNESCO world heritage list on July 7, 2008. Situated on the edge of a plateau that dominates the plain of Cambodia, the Temple of Preah Vihear is dedicated to the Hindu god Shiva. The UNESCO World Heritage Committee on 8 July 2017 inscribed the Temple Zone of Sambor Prei Kuk, an archaeological Site of Ancient Ishanapura, in Cambodia as the World Heritage site. Cambodian agricultural expert Yang Saing Koma was announced as of one of the recipients of the prestigious 2012 Ramon Magsaysay Award for his contributions to increase Cambodia’s rice production by encouraging small farmers to shift to organic fertilizer. The Ramon Magsaysay Award is often considered Asia's Nobel Prize. Archaeologists in Cambodia have unearthed a large statue believed to date back to the late 12th century, as revealed on 29 July 2017. The statue is believed to have once stood guard over an ancient hospital at Cambodia's world-famous Angkor temple complex. Authorities in Cambodia confirmed that children bathing in a newly dug pond accidentally unearthed six ancient Buddhist statues believed to be around 1,000 years old. The statues were found on 15 August 2012 in Khleng Por, about 80 kilometers (50 miles) north of capital Phnom Penh. Cambodian athlete Jessa Khan won the gold medal in the women's ju-jitsu newaza 49 kg category at the 18th Asian Games in Indonesia on 24 August 2018. A Cambodian project, Transforming Steung Meanchey through Education, aims at providing education and care for children and families from the Steung Meanchey landfill district near Phnom Penh was announced as one of the winners of the 2012 World Innovation Summit for Education (WISE) Award on 19 September 2012. Cambodia became a member of the World Trade Organization (WTO), an organization commenced to deal with the rules of trade between nations, on 13 October 2004. Hun Many of Cambodia won the prestigious 2015 Gusi Peace Prize in the Youth Leadership & Humanitarianism and Advocate of Cultural Heritage category. Independence Day of Cambodia. 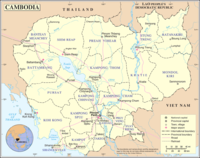 Cambodia gained Independence from France on November 9, 1953. The United Nations International Court of Justice (ICJ) on 11 November 2013 ruled that Cambodia has sovereignty over the whole territory of the Preah Vihear temple, a disputed patch of land on the Thai-Cambodian border, and that Thailand is obligated to withdraw its military personnel from the area. The 21st Association of Southeast Asian Nations (ASEAN) Summit, a three-day annual meeting between Southeast Asian nations, kicked off in the Cambodian capital Phnom Penh on 18 November 2012. US President Barack Obama on 19 November 2012 arrived in Cambodia to join the annual Association of Southeast Asian Nations (ASEAN) summit. The trip marks the first time a U.S. president has visited Cambodia, which is hosting the summit on 18-20 November 2012. Cambodia was admitted as a member of the United Nations (UN) on 14 December 1955. Cambodian scientists along with their international colleagues have discovered a new species of legless amphibian resembling a giant earthworm or a snake in Cambodia's south-west Cardamom Mountains. Their findings were presented in the Organisms Diversity & Evolution scientific journal on 24 December 2014. Cambodia and Vietnam signed a financial cooperation agreement on infrastructure development on 26 December 2013. The pact is aimed at joint implementation of construction of Long BinhChreythom Bridge, which links Vietnamese province of An Giang and Cambodian province of Kandal. Cambodia and Thailand announced the implementation of the Ayeyawady-Chao Phraya-Mekong Economic Cooperation Strategy (ACMECS) single visa, effective on 27 December 2012, in order to facilitate cross-border trade, connectivity and tourism.